A 64-year-old man armed with more than 10 rifles shot up a Las Vegas country music festival, killing at least 59 people in the largest mass shooting in US history. Investigators are still trying to establish the motive behind Sunday's mass shooting in Las Vegas. Jay Grey has more on what investigators know about killer Stephen Paddock, five days after the tragedy. Many Americans fiercely defend their constitutional right to own a gun, even after the Las Vegas massacre. Others can't understand America's refusal to crack down on deadly weapons despite the regularity of mass shootings. Our correspondent Jon Brain has been to a shooting range in Nevada, to meet the gun owners who are determined to hold onto their firearms. In the United States investigators are trying to piece together the cause behind Sunday's massacre in Las Vegas. They admit that the shooter, Stephen Paddock, never roused suspicion before the incident. But as more details emerge about the gunman so do more questions as to how he pulled off his attack. Harry Horton has the latest. New footage has emerged showing concert goers fleeing the gun attack at that country musical festival. Mark Gay looks now at the many questions surrounding the shooting. The girlfriend of Stephen Paddock, the gunman blamed for the massacre, says she had no idea he was planning the attack. Her comments came on the day US President Donald Trump visited Las Vegas to meet the injured and thank those who helped the victims. Marilou Danley described the Paddock she knew as a kind and quiet man. But Las vegas police have called him dangerous and disturbed. Investigators in Las Vegas have found 23 guns in the Mandalay Bay hotel room from which a retiree shot dead 59 people and wounded more than 500 others. Investigators have found no political or religious motives for the shooting. Vigils have taken place throughout Las Vegas to remember the victims of the attack and people send messages of solidarity and mourning. Jon Brain reports. President Donald Trump plans to travel to Las Vegas on Wednesday following a mass shooting at a country music festival in which at least 59 people were killed and more than 527 were injured late Sunday, making it the worst mass shooting in modern American history. Investigators in Las Vegas have found 23 guns in the Mandalay Bay hotel room from which a retiree shot dead 59 people and wounded more than 500 others. Investigators have found no political or religious motives for the shooting. 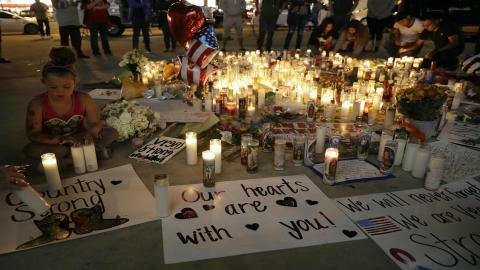 Vigils have taken place throughout Las Vegas to remember the victims of the attack. Harry Horton reports. The gunman, retired accountant Stephen Paddock, was positioned in a suite on the 32nd floor of the Mandalay Bay Hotel. From two windows, he shot at the 22-thousand people attending an outdoor concert below. There was little the crowd could do to escape. Many witnesses say they didn't even know what direction the bullets were coming from. Jon Brain reports. The United States is in shock after the deadliest mass shooting in the country's recent history. At least 59 people have been killed and hundreds injured after a lone gunman opened fire at concert-goers from a hotel window in Las Vegas. It's still not known what motivated the suspect, who's been named as Stephen Paddock. TRT World's Jon Brain has more from Las Vegas. The horror that unfolded in Las Vegas is once again, shining a light on gun control in the United States. Tetiana Anderson has more on an issue that continues to divide Americans. Now on the minds of many in the United States, gun control. Tetiana Anderson has more on a topic that has long-pitted American against American. More than 50 people have been killed and at least 200 injured in a mass shooting at the concert Country music star Jason Aldean in Las Vegas. Police say the gunman opened fire from the 32nd floor of the Mandalay Bay Hotel. Las Vegas concert shooting ranks as the worst mass shooting in recent US history. The worst had been in Orlando Florida last year when gunman Omar Marteen opened fire inside the pulse nightclub killing 49 people. The Virginia Tech shooting in April 2007 saw 32 people shot dead by 23-year-old student Seung-Hui Cho. The fourth deadliest mass killing was in December 2012 at Sandy Hook Elementary in Connecticut, when Adam Lanza gunned down 20 children and six adults just before Christmas. More than fifty people have been killed and at least two hundred injured in a mass shooting at a concert in Las Vegas. Police say the gunman opened fire from the 32nd floor of the Mandalay Bay Hotel. Christine Pirovolakis has the latest on the worst mass shooting in recent US history. The Las Vegas sheriff says more than 20 people are dead and more than 100 people were wounded in the attack at an outdoor concert on the Las Vegas Strip in the US state of Nevada. Police killed one gunman on the 32nd floor of the nearby Mandalay Bay Hotel. At least one gunman is on the loose in Las Vegas, having opened fire at a country music festival. At least two people are dead and another 24 injured. Police have closed off the area around the Mandalay Bay Hotel and Casino, after automatic gunfire was heard from about 10.20pm local time. Las Vegas Police are urging people to avoid central Las Vegas. A gunman on the 32nd floor of Mandalay Bay casino opened fire during Route 91 Harvest Festival., killing at least 20 people — including two off-duty police officers — and wounding more than 100, officials said early Monday. Country music star Jason Aldean was performing when the shots began ringing out Sunday night at the Route 91 Harvest Festival.